The first birthday party I ever planned for myself was when I was in the fifth grade. 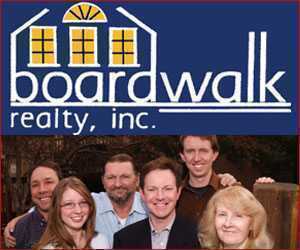 The itinerary went like this: The minivan departs our Denver suburb for Boulder. Important note: The chauffeur (i.e. my dad) must take the birthday party crew along “the scenic route.” That’s Colo. 93, which hugs right up next to the mountains and sneaks into Boulder from the south. First stop was Chautauqua to play lawn games, including a badminton sort of game with a Koosh ball (’90s child here). Second stop was the pizza buffet at Beau Jo’s, right up the street from the park. But a venture down to Pearl Street was the grand finale and ultimately the reason I chose Boulder to play host to my birthday party. I couldn’t wait for my friends to be awed by the street performers who brought Pearl Street alive on summer nights with top-notch interactive theater. These buskers aren’t your typical mimes or magicians. Rather, they’ve got some unique talents because, well, everything is always a little different in Boulder. Throughout my childhood and well into my adulthood, watching the Pearl Street Mall has been one of my favorite entertainment venues (just people-watching is a fun sideshow). Whenever my family hosted out-of-town guests, we’d take them to Pearl Street so they could try to stump the “Zip Code Man,” who can tell you exactly where you’re from based on the five-digit zip code you give him. 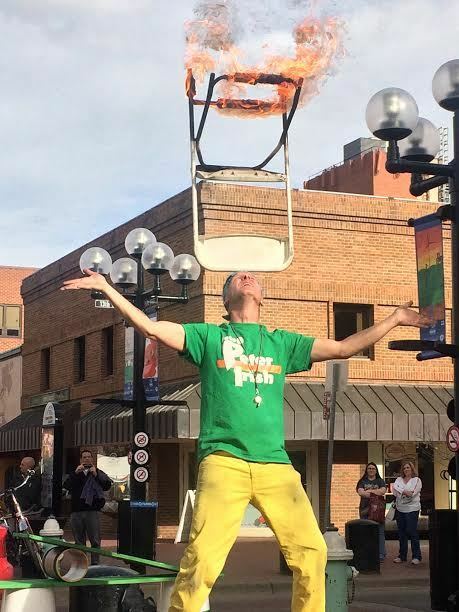 Even when I was a newspaper reporter working on the Pearl Street Mall, I’d pause while walking to the office to catch a guy juggling flaming clubs, because let’s be honest, it’s hard to look away. So, without further ado, here’s your guide to Boulder’s quirkiest theater, the Pearl Street Mall, where you can watch interactive shows typically between the 12th and 15th blocks. Perhaps Boulder’s most famed performer is David Rosdeitcher, aka the “Zip Code Man,” who has memorized more than 35,000 zip codes. When his crowd gathers, he asks if anybody is from out of town. 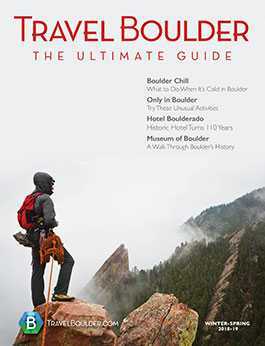 (Almost everybody is from somewhere other than Boulder.) Naturally, a few hands dart up in the air, with audience members thinking they’ll be able to throw him off. I can’t recall a time he hasn’t nailed it, though. On a recent afternoon, a woman shouts out “36701” and, without hardly any hesitation, the Zip Code Man does his mental magic and responds “Selma, Alabama.” For his next trick, he’ll even tell you about a restaurant in your city. As he’s stretching on a rug he spreads out on Pearl Street, Ibashi-i starts gathering a crowd by yelling “Showtime!” and “Everybody look at me!” It’s hard to look away. 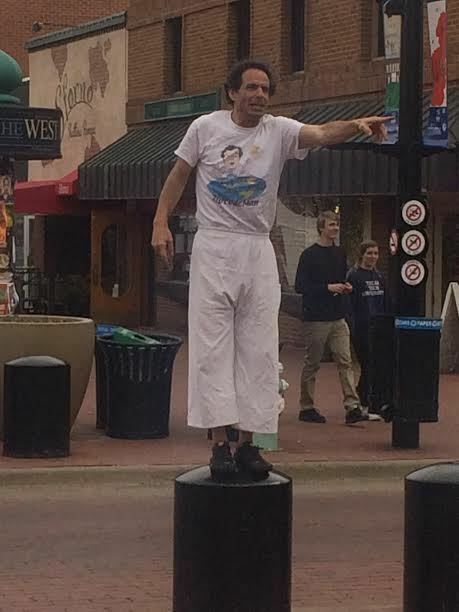 Ibashi-i is a Boulder fixture, who has been performing on the Pearl Street Mall for 25 years. 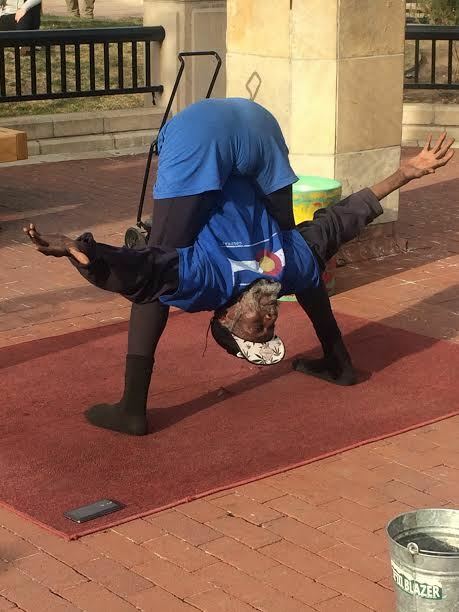 He calls it “Rastafarian Yoga” and he bends and contorts his body into some seemingly impossible positions. Overheard in the crowd on a recent afternoon was a puzzled spectator who questioned, “Does he have any joints?” This could have been a double-entendre because he does have a favorite 420 hat that he dons. His grand finale is twisting his 6-foot-tall, 160-pound body into a 20-inch Plexiglass cube. Signature quip: After he emerges from the cube, he fans his nose and makes a fart joke. Part juggler, part comedian, part stuntman, Peter Irish puts on quite the one-man show. His show starts out with an impressive balancing act as he juggles while teeter-tottering on a board he sets up. By the end, though, he’s balancing a flaming chair on his head and squats down into a yoga position. His show is also full of one-liners, like “the crowd goes mild” when he doesn’t elicit thunderous applause.